PENTACON SUPER + CARL ZEISS JENA PANCOLAR 55mm F 1.4. 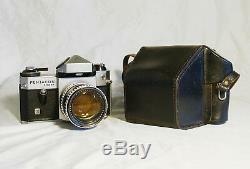 Rare Pentacon Super vintage camera with Carl Zeiss Jena Pancolar 55mm f 1.4 lens. Very good cosmetic conditions with minimal signs of age. The camera works at all shutter speeds as well as the. TTL prisma meter with his proper battery. The lens has a well visible scratch on the side of the front glass and some dirt on the inside. I tested it on a digital camera and it seems not to affect the pictures. (I can provide image samples on request if needed). Focus ring is smooth but a little stiff when rotated clockwise. The Self timer shutter release lever at the bottom of the camera is missing (see picture). Black leather case (previiosly repaired on the left side) is provided. The item "PENTACON SUPER + ZEISS JENA PANCOLAR 55mm f1.4 + BAG VERY RARE VINTAGE CAMERA" is in sale since Wednesday, January 2, 2019. This item is in the category "Fotografia e video\Fotografia analogica\Fotocamere analogiche". The seller is "vintage_and_modern_collectibles" and is located in Italia. This item can be shipped worldwide.